Original Content: Can You Believe It? National Punctuation Day? Yes, indeed, National Punctuation Day exists, and we are living it as I write this. 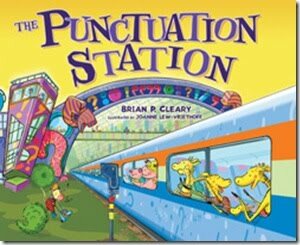 So this seems like a good time to post a bit about The Punctuation Station by Brian P. Cleary with illustrations by Joanne Lew-Vriethoff. The Punctuation Station is a nicely done meshing of text and illustration in which basic punctuation marks are explained. It's written in rhyme, by the way. The writing is appropriate to the age group, assuming that picture books are read by the preschool age group. But do preschoolers need to know how to use punctuation? As I was reading The Punctuation Station I wondered, Why? I expect most picture book readers to need to be read to. Or, at the very most, to be emerging readers. If they're doing any writing at that point, do they need to be all that meticulous about punctuating it? Then I recalled the young teacher who told me about classroom read-alouds. The Punctuation Station would probably be another example of a kind of picture book that would make a very fine read-aloud, this time in classrooms where post-picture book students are learning to punctuate. Enjoy the rest of your National Punctuation Day. Labels: 2010, Reader response. Picture books. nonfiction.